Mozilla launches improved Session Restore in Firefox 33 | ComTek Computer Services Inc. I rely a lot on Firefox's Session Restore feature. I have configured the browser to always open the last session when it gets opened and for the most part it works just as advertised. While there are other methods to ensure that, like bookmarking tabs regularly before you close the browser, it is not really as comfortable of an option as the built-in session restore feature. With that said, the Session Restore feature of Firefox is far from perfect. While it does a good job normally, I sometimes experienced issues in regards to that. Sessions would not be loaded but the Firefox home page would. That's a big problem if you rely on the feature as you may not be able to recover all websites that were open during the last browsing session. You can try and recover sessions, but that may not work all the time. Some users have helped themselves by using third-party add-ons instead like Session Manager which provides you with more control over the whole saving and restoring process. Mozilla just announced that it has made improvements to Firefox's Session Restore feature that it plans to ship with Firefox 33. 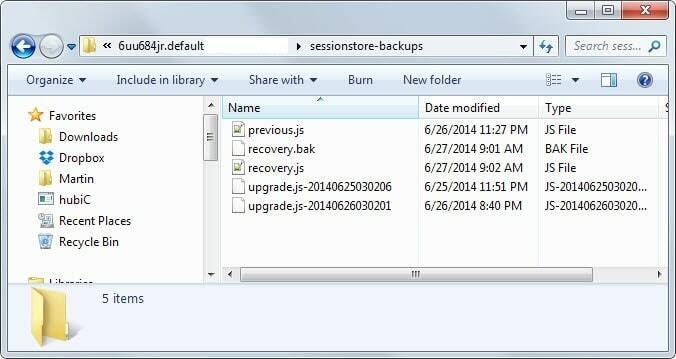 The new feature attempts to minimize data loss in regards to sessions by improving how backups are stored and recovered again.